The Best Web Hosting Award is presented to the host that provides the best shared web hosting service at a competitive price. Note that 8 of the 10 ranking factors are completely data-driven, while only two — ease-of-use and satisfaction — include reviewer opinion. See our Shared Host Ranking Methodology page for complete testing and rating parameters. See the individual host reviews for detailed test results and ratings. None of the 50 hosts tested was able to achieve a perfect, 5-star rating average. Three hosts achieved the highest average score of 4.7 — A2 Hosting, HostNine, and Certified Hosting. In order to break the tie, the three hosts were ranked in order of average worldwide page-load speed. It is worth noting that of the 50 hosts tested, A2 ranked #1 for US page-load speed (0.7605 seconds), and #3 for worldwide page-load speed (1.1286 seconds). 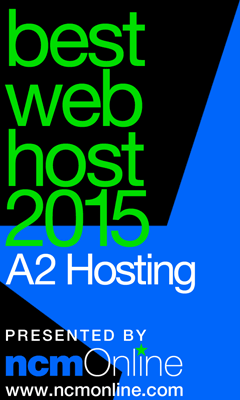 NCM Online is proud to present its Best Web Hosting Award for 2015 to A2 Hosting.